With iPad managed to be jailbreak with Spirit, the hacker MuscleNerd of the iPhone Dev Team has managed to use the Spirit jailbroken iPad 3G to send SMS text messages. iPad 3G, though accepts a SIM card downsized to microSIM dimension, does not have phone functionality such as voice call, SMS or MMS, as the SIM card is used only to provide mobile data or mobile broadband service. Unfortunately, the sending of SMS with iPad 3G remains proof-of-concept for now, as the hack requires input of raw commands at command line user interface, as the hack requires communication directly with iPad baseband. There is no GUI (graphical user interface) yet, nor the Apple’s MobileSMS app used in iPhone home screen can work in iPad. 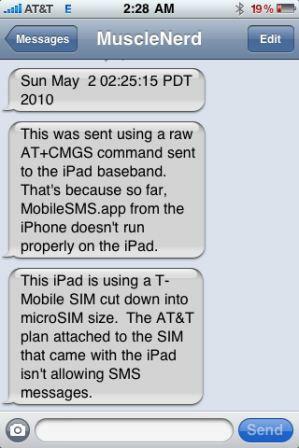 In addition, the AT&T 3G microSIM that comes with iPad does not allow SMS text messaging, so the hack won’t work. The hack requires SIM cards that allow SMS, such as normal AT&T voice and SMS plan SIM or T-Mobile SIM (but requires cutting to microSIM dimension) as used by MuscleNerd in his video demonstration of sending SMS from iPad show below. The video clearly demonstrates the potential of what’s can be done on a jailbreaked iPad.